August 23, 2015 Martial Arts, Muay Thai, Personal Development, SportsCombat Sports, FightingThe Little fighter still has a big heart. So this week, I’m pleased to say I’ve spent loads of time at the gym. A good run yesterday as well was a welcome addition and is always good for keeping the weight down and the fitness up. At the moment I’m on a real mission with training and I’m making sure I stick to my guns of training all week Monday to Saturday. I would train twice a day if I could. I certainly have the time and the permission. I’ve been reflecting a lot recently on training many years ago now in Gosport and then Bournemouth mainly because of my writing project ‘The last of the good guys’. I’ve just started talking about when I first started training so being the social media freak that I’ve become, I was pleased to find quite a few pictures of me back in the day on my Facebook. I realized a couple of days ago I never use to think so much about doing something as I do now. I just did it. There’s a few things I do now without thinking about them but I still find myself (from time to time not all the time )sliding into a trap of over thinking something before I do it, or even worse whilst its happening. I guess even now, I sometimes need to believe in myself a little more and have faith in my own ability. And in the same respect, it’s very important for me to make sure those that I train with are very much on the same ‘mission’ as me. After all sometimes you need to remember that there is no such thing as I can’t. Not in a Thai boxing gym anyway. So this week has been a mix of tough drills and one hell of a lot of cardio as well as some technique too. As always it’s been a good push but one that’s more than worth my time. Today I got myself out to Team Tieu in Cheltenham for a open day/seminar with Philip Tieu and some of the other trainers and fighters from the camp. I’m pleased I went and it was a good afternoon. We started off with a light shadow box and then Philip took us through basic stance and some footwork drills as well as practising stepping in a little on our jab but keeping our back foot planted. These were the sort of techniques my old trainer Sert Hataisantiwong used to have me practising in my Sakprasert days when I first started training with him, so it was familiar territory. It was good to start from the ground up. We moved on from there onto kicking over our partner’s arm with our right and left legs. Rather than continue with the momentum of the kick we stopped it half way as you would do in a fight if you missed your shot and got back into stance. We then started practising some boxing combinations with our partners on the pads. I was pleased to find my boxing is strong at the moment, I’ve got a nice solid cross and my jabs getting a long stronger too. My left uppercut and right hook isn’t too shabby either. I found I was focusing a little too much on power at points but I was still pretty quick with my hands and I hit hard these days so I’m a happy boy. We moved onto kicks and then some kicking and teep combinations. I was happy again to see that my left kick is heading in the right direction, and although it’s still a work in progress. (I intend to have it down to a fine art before I go back to Thailand next February. I’m not having Penthai pick on me again.) It’s nice and strong and there’s a bit more twist than before. I still need to work on my balance as we had to throw a kick and then block without our leg touching the ground and also do the same but different. We had to teep before our leg hit the ground. These aren’t complicated techniques, but made me think a lot more about stance. I was a little wobbly or I let my leg touch the floor, but pulled it off a couple of times. Kicking with my left then teeping off my lead leg was fine, again a technique I got shown many moons ago and still practise shadow boxing and occasionally in sparring. I think it’s a nice way to hurt them then create a little safety distance to set them up for something else. We also practised kicking/blocking our opponents kick with our leg across their hips, in long guard to stop the punches coming in. Although this wasn’t a familiar technique, I’ve seen it used many times by Thais in fights and I was pleased it worked for me a couple of times so I’ll keep on practising it. Philip then moved into teaching us some clinching techniques, and things got a little interesting as the guy I was clinching with was a lot taller than me which of course came as a total shock due to my height advantage. Not all the techniques were as easy as they first seemed but weren’t too complicated to be impractical. It seems the order of the day with Team Tieu is to keep things simple but effective. There was a couple again that I’ve taken away with me, and I want to make sure that I’m practising clinching in sparring at least a couple of times a week. It’s easy to overlook but I know from first hand experience, when it comes to fighting it’s a strength of mine. 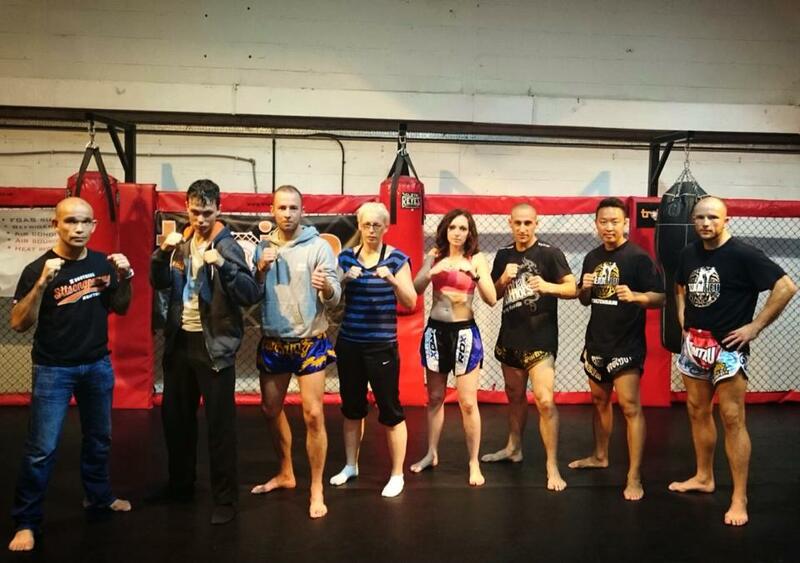 We also got shown a pad work demo and all in all I was impressed with the standard of Muay Thai from the camp. I’ve heard good things about them and I’m going to make an effort to head out and train with them when I can. From what I was told Saturday sessions are pretty tough, and the format is similar to training at a Thai camp and there are a few fighters there which is what I want. Of course I’m still training at my current gyms too but I guess it goes back to my blog a few weeks ago about progression. I’m all about the learnings. I always will be. So next week onwards I’m back into the mix and ‘going all out to put my one and all in again’ I want to make sure I’m ready to fight later this year and that I’m still doing my best to get to the top of my game. I guess self belief and relentless optimism are the key. It’s a long road, but I knew that way back before my heart grew big. Have a good week, train hard and walk tall. I’ll see you on the road.